Summer is coming, so bring out the BBQ, the patios, the lemonade and the swimming pool! But wait – what to swimming pool wear?!?! Through my years, I’ve struggled with what to wear when going to the beach or to a swimming pool. Personally, I love swimming, it’s been my favourite Sport (per say) since I was a child. But as I grew, I had my faith to think about, so I wondered if there were modest options. 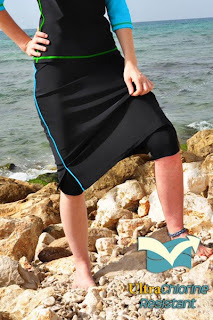 A few years back I came across a few webpages that actually dedicate to creating modest swimwear, I was like, yey!! I’m not alone in this. The downside can be that because it’s such a small market, the pricing can sometimes be high. However, below I’ve posted a few options from a few websites which you could order these modest swimsuits from. They are made of great material which dries fast. Another option is to get the idea and get one made out of similar materials. Most of these outfits are created for use when working out as well, the come with leggings or skorts underneath for added modesty. Each photo is linked to the source. Consider the options, you can still be active and be modest! I'm not sure where this one is from, but if you are considering the option of making one, this is a neat example to follow. The floral top is cute. This is what the ladies back in the 1900’s wore for swimming. So sad to see how society has changed so much. I once read a quote that said something along the lines of “what one generation allows in moderation, the next will do in excess” That is so true. We must be careful what we allow in our lives and remember that there is another generation rising up behind us, who look up to the previous one for example!